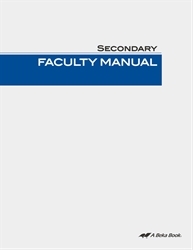 Need to create a faculty manual for your junior high or high school, but not sure what to include in it? This resource provides an excellent guide for principals to adapt in completing their own school teacher manuals. Gives procedures and guidelines for handling the different aspects of the school year, such as orientation meetings, teacher responsibilities, evaluating students, and so much more. From assembly and chapel to extracurricular activities, we’ve got it covered!